Your first impression as you walk into the Florida Aquarium is how huge this attraction is as signs and elevators lead off in various directions promising plenty of things to see and do. Pick up a guide of “What’s swimming your way today” so you don’t miss the excellent presentations that take place throughout the day at various aquarium locations. You may want to linger at the Horseshoe Crab Observation Pool before heading up the elevator to begin your underwater adventure at the Coral Reef exhibit. This includes a huge aquarium with beautiful colored fish and mesmerizing rays that flap gently past or slide up the glass showing their amazing mouth and gills. Shoals of silver fish swim by along with more vibrant colored species such as bright blue tangs, surgeon fish, neon-colored parrot fish, angel fish, hog fish, spotted porcupine fish and the menacing open-mouthed green moray eels, among many others. This area includes a walk-through tunnel to see the fish, sharks and eels above and beside you. With various viewing windows, it’s a great place for photos. The corals and anemones in the smaller side aquariums are almost as brightly colored and diverse as the fish themselves. You’ll emerge near the floor-to-ceiling panoramic viewing window where you can take a seat for a presentation or just sit and watch children getting up close to sharks, giant barracuda, tarpon, grouper and turtles all so much bigger than they are! 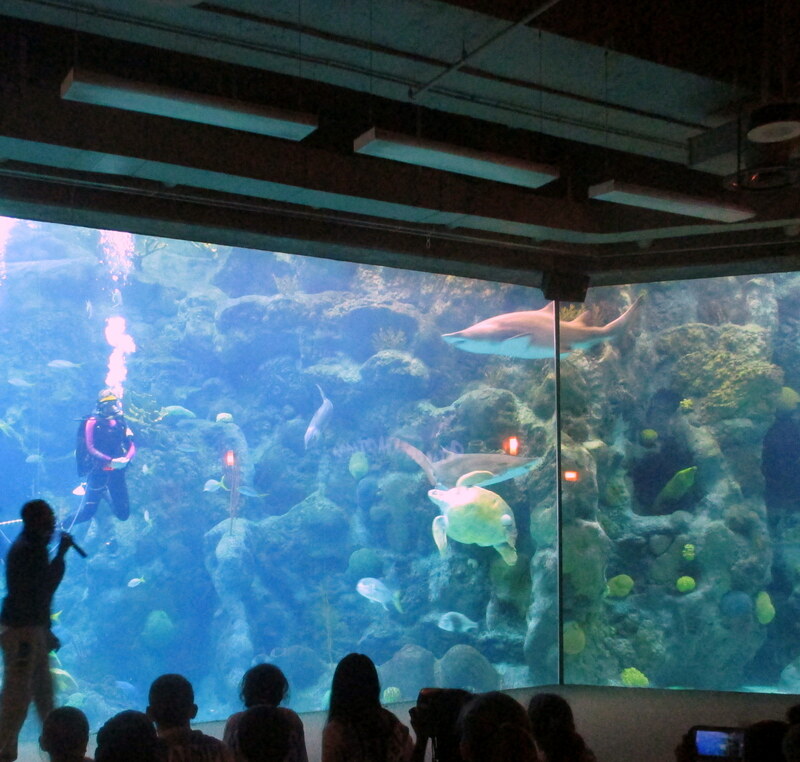 This mega-huge aquarium is large enough to have presentations with scientific dive masters actually inside the tank talking to the audience. The educators identify the various species and share some fun facts and ecological advice with the audience. The displays start with a short film promoting awareness of the fragility of our reefs and the dangers of pollution and waste disposal on the oceans. Close by are more aquariums with the strange sea horses, pipefish and sea dragons which look like floating seaweed until you take a second look. The Ocean Commotion offers another great viewing widow to see jellyfish, octopus, crabs and countless tiny colored fish swimming in tight choreographed shoals. The River Tales exhibit offers a change of pace with a stream with wood ducks and ruffleheads bobbing above the fish in a fun display. You’ll see many of the fish that live in Florida rivers such as longnose gar, catfish and bluegill. Further on there’s a huge gator display – the best way to get up-close and see these scaly Florida natives in detail! Diving river otters attract plenty of attention as they flip and dive. Another local feature is the cypress swamp where herons, pink spoonbills, ducks and glossy ibis live on the water. There’s a great viewing platform if you climb the steps to see the birds at eyelevel, perched in the trees. A detour to the Rivers of Madagascar offers rainbow-colored shoals of Outer Reef Fish on beautiful corals and there’s a display of curious ring-tailed lemurs, also from Madagascar. After taking in the penguins, lobsters and Goliath grouper there’s the opportunity to stroke stingrays in a shallow touch tank. After a break in the café you can enjoy water in a different way, cooling off with water jets, cannons, fountains and slides around a pirate ship in the 2.2-acre Explore-a-Shore waterpark. If you enjoyed reading about this fun experience near Clearwater, you will love the newly updated book/ebook Days Out Around Clearwater and St Pete Beach available on Amazon from just $4.99. Happy trails! Greetings from your international roving reporter! Based in beautiful Cornwall UK, I am a freelance travel writer and published author of several travel books. As the wife of a Master Mariner, I have travelled extensively and lived in exotic locations all over the world including the Far East, Europe, Australia and the Republic of Panama. I would describe myself as having “endless itchy feet and an insatiable wanderlust”, as I continue to explore Europe, Florida and further afield, writing about my experiences with humour and attention to detail. BTW, I have a Diploma from the British College of Journalism and am a member of the International Travel Writers’ Alliance and the Gulf Coast Writers’ Association. This entry was posted in Florida and tagged attractions, Clearwater, Florida Aquarium, St Pete Beach, Tampa, things to do. Bookmark the permalink.